Looking for something a bit different for your company away day or jolly? Here at Corporate Dance we can offer you any kind of dance class or workshop to entertain you and your colleagues. Dancing is a great way to break the ice between work colleagues, and clients too if they're also going to be included. It's very hard not to have fun and enjoy learning to dance, or learning a routine. Our most popular dance workshops are from 1 to 4 hours long and are based on a chosen dance style or to learn a routine to a song. See our Example Dance Workshops for more information. Note: Certain workshops can be held in a room with a carpeted floor. You can arrange the venue, or we can for you. Naturally if you're already away at a specific location for the day/weekend, then it makes sense for the workshop/classes to take place right where you are. IMPORTANT: If you don't see here what you'd like to do, don't worry. This is just a sample of dance workshops. 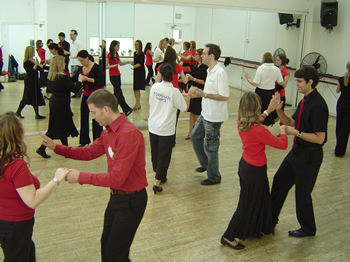 We can pretty much create any kind of dance class or workshop based on any style. Just contact us to discuss it.